As part of an ongoing effort to respect Bali’s rich cultural heritage, Alaya Resort Ubud successfully hosted a week of temple festivities from Sunday, 16th September to Monday, 27th September 2018. In conjunction with the resort’s temple anniversary, also known as piodalan, this series of exciting events included a Sekar Madya Competition, Gebogan Competition, Piodalan Ceremony, Dharma Wacana and Tirta Yatra. In the lead up to the temple ceremony celebration, Alaya Resort Ubud carried out a ritualistic Balinese activity called “Sekar Madya” on Monday, 17th September 2018 at Bale. This involved a performance of ancient Javanese songs/chants of worship, which have both traditional and religious significance. Alaya Resort Ubud also held an inter-department Gebogan Competition on Tuesday, 18th September 2018 at Bale. This cultural activity was conducted to promote team work and enhance solidarity between all staff members. Gebogan is a Balinese offering designed to symbolise the triangular shape of the island’s sacred Mount Agung. It consists of many kinds of fruits, cakes, flowers and other ornaments that are arranged in colourful layers on a carved stand. When a collection of elaborately constructed gebogan are presented as offerings to God Almighty, they are ‘delivered’ to the temple by a parade of women carrying them on top of their heads. Gebogan also serve as a form of decoration at traditional ceremonies such as weddings and rites of passage celebrations. In the spirit of bringing Balinese culture and people together, Alaya Resort Ubud hosted its Piodalan (temple ceremony) on Wednesday, 19th September 2018 at the Padmasana area. 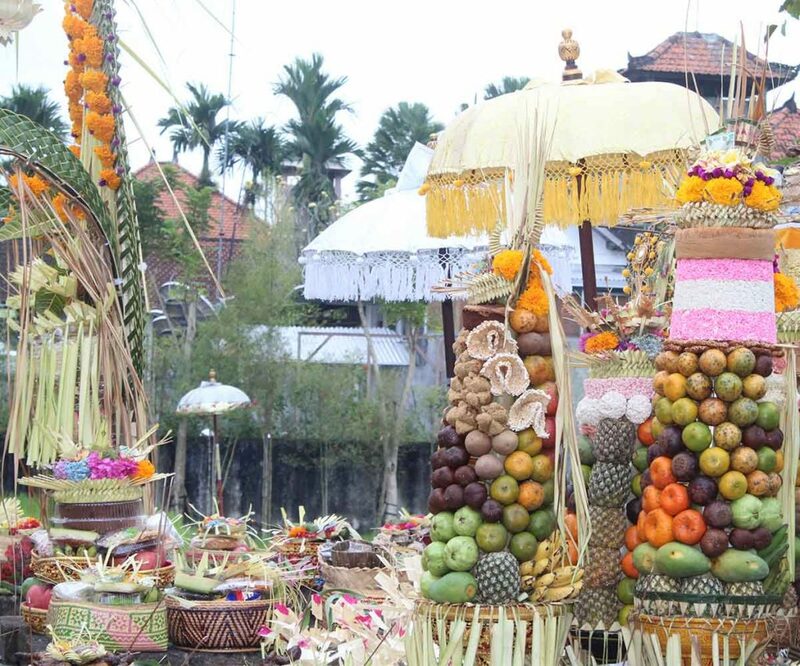 This is a religious ceremony related to the birth of a sacred place/dwelling in accordance to the Balinese calendar. The majority of Balinese Hindus perform such a ceremony each year to show that they are grateful for all that has been bestowed upon them, whilst seeking future blessings as well. Another essential component during this week of activities was Dharma Wacana, a religious sermon for all Hindu staff members at Alaya Resort Ubud. This was delivered by Mr. Ida Bagus Purwa Sidemen, the Executive Director PHRI (Indonesian Hotel & Restaurant Association) Bali chapter. Dharma Wacana serves to illuminate and inspire followers through Hindu teachings about spirituality. These talks are intended to help people fulfil their religious and community obligations in order to lead a more harmonious life. As the week of temple festivities drew to a close, Alaya Resort Ubud management and staff members participated in a Tirta Yatra religious activity on 26 & 27 September 2018 at Nusa Penida. Derived from Sanskrit, the term tirta yatra literally means “sacred holy water pilgrimage”; a journey (normally of a substantial distance) to seek and or collect holy water. These days in Bali, the original meaning is somewhat lost and tirta yatra means simply a holy or spiritual pilgrimage. Tirta yatra, unlike spiritual journeys by holy men of a bygone era, can be carried out by anyone of any caste and socio-economic status. Balinese believe that titra yatra brings one closer to God, as well as fellow pilgrims. It is considered an important part of the Tri Hita Karana philosophy, which is the balance between humans, god and nature. During this religious outing, the Alaya team visited a number of temples at Nusa Penida; Pura Dalem Ped, Pura Puncak Mundi, Pura Goa Giri Putri, Pura Dalem Bungkut. All participants prayed together and then took part in a ritual cleansing ceremony called melukat to purify the body, mind and soul with holy water. Then everyone in attendance gathered to clean up the temple area. A significant donation was also given to help maintain the site and its facilities (toilets, parking etc). Given the ever-increasing popularity of spiritual tourism and the large number of pilgrims now choosing to pray at Nusa Penida, this donation was gratefully received by the temple’s resident priest. Lastly, the Alaya team finished off with “Mekidung” (singing in Balinese), Dancing and Dharma Tula. 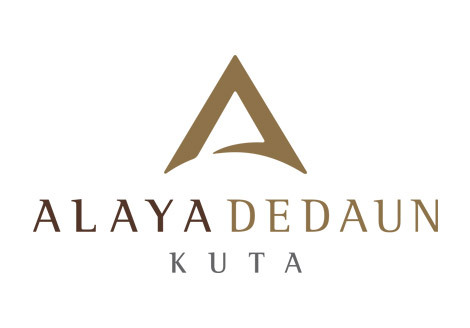 During this week of religious activities, Alaya Resort Ubud invited all in-house guests to experience this unique temple festival. They were given the opportunity to dress in traditional sarongs to express gratitude for all of the blessings bestowed them by God Almighty. The ceremony also reinforced the resort’s commitment to Tri Hita Karana, a Balinese Hindu lifestyle philosophy that is all about maintaining a harmonious balance between mankind (Pawongan), the environment (Palemahan) and God Almighty (Parahyangan).